Modern, bright and new villa located in a privileged position That Guarantees relaxation and privacy. 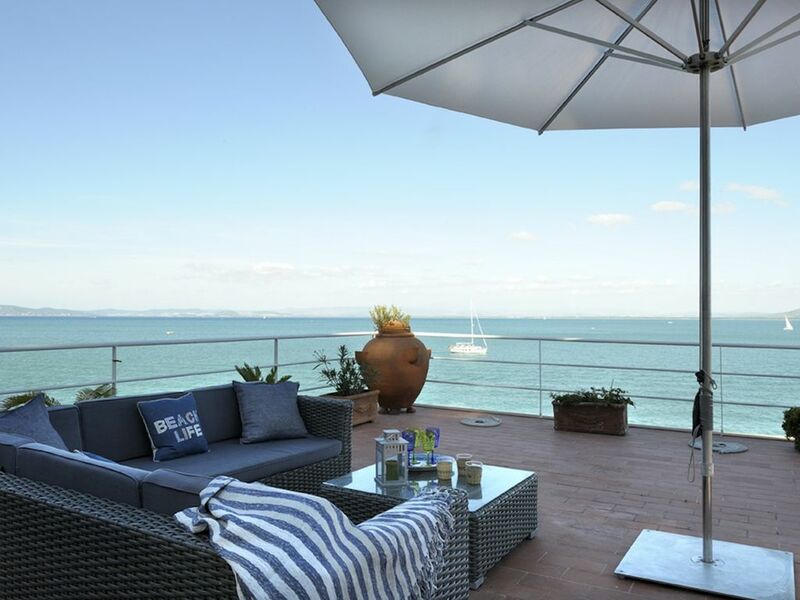 The villa is located above the sea (direct sea access) and has a breathtaking view of the sea, the peninsula of Argentario and the island of Giglio. It's close to the village center (2 minutes walk) where you can find everything you need: pharmacies, doctors' offices, grocery, banks, bars, wine shops, restaurants and boutiques. The villa is the ideal place for Both a family vacation as well as the blackberries elite who loves to swim in a wonderful blue flag sea and like to visit Within easy driving distance Pisa, Lucca, Chianti and all the wonderful surrounding Tuscany. At the entrance, on the left there is an airy living area with two sofas, TV with flat screen television and a dining table for eight people and the kitchen. All sides of the room give direct access to the terrace through one large windows and two glass door. The villa has three bedrooms: two king size bedroom with en-suite bathroom with shower, air conditioning, hairdryer and toiletries with a wonderful sea view and one bedroom with two bunk bed plus another bathroom with shower. The outdoor lounge area is furnished with lounge chairs, tables, sofas, cushions and various lighting to make it the perfect area to relax Both during the day as well as well into the evening and night. We really enjoyed our stay at this waterfront house. The views are fantastic. It is just a short stroll to Santo Stefano's main shops and restaurants, but in a quiet, residential location without traffic noise...just the sound of the waves. Two of the bedrooms have their own attached bathroom, and the 3rd bedroom, which has 2 bunk beds, has a bathroom right across the hall. The owner was very helpful, quick to answer any questions, and corresponds in English very well. Caretaker was prompt for check in/check out. We would be happy to rent here again. Das Haus bietet alles, was man für einen entspannten Urlaub benötigt. Ruhig gelegen am Ende des Ortes kann man auf der Terrasse und dem Sonnendach die Sicht auf die Bucht genießen und dabei die ein- und ausfahrenden Schiffe beobachten. Der eigene Zugang zum Meer ist top und tut sein übriges. Fußläufig sind der Hafen und der Ortskern des schönen Städtchens mit seinen Restaurants und Geschäften schnell zu erreichen. Das alles bescherte uns einen ruhigen, entspannten und erholsamen Urlaub. Très bel emplacement sur la mer, à 5 min du port, dans une impasse très calme. 2 places de parking prévues. 2 canoës à disposition. Seul bémol : un peu juste en serviettes de toilette. Nous n'avions pas tous une grande serviette, et aucune serviette de rechange. Das Haus liegt ideal mit direktem Zugang zum glasklaren Wasser, in dem man super schnorcheln kann. 3 Schlafzimmer, 3 Bäder. Für 7 oder 8 Personen eher nicht geeignet (zu wenig Handtücher, zu kleine Töpfe). Ansonsten toll. Oben Sonnenterrasse unten Balkon im Schatten, Liegestühle für alle und ein toller Ort, den man zu Fuß erreichen kann. Es war wunderbar .... Aufgrund der schönen Objektfotos sind wir voller Vorfreude in den Urlaub gefahren und wurden auch nicht enttäuscht. Man wohnt wirklich direkt über dem Meer und hat sowohl von der großen Dachterrasse als auch vom Wohn- und Schlafzimmer einen herrlichen Ausblick auf Meer und Küste. Über eine kleine Treppe direkt am Haus ist das herrlich klare Wasser zu erreichen. Beim Schnorcheln konnten wir erstaunlich viele bunte Fische beobachten. In ein paar wenigen Minuten zu Fuß erreicht man die Hafenpromenade, wo man die frischesten Meeresfrüchte, leckere italienische Küche mit gutem Wein genießen kann. Dolce Vita pur! Argentario is a rocky promontory round and connected to the Tuscan mainland by two long strips of sand, but it Retains the characteristics and atmosphere of the detached island it used to be. Monte Argentario Became less isolated When the shallow waters Began to silt up creating the two extended sand bars of Giannella and Feniglia, Which are now two long sandy beaches backed by thick maritime pines and separated by the Lagoon of Orbetello. In 1842 the charming small town of Orbetello Achieved a fixed link to Monte Argentario through the center of the lagoon by means of a well engineered dyke. The lagoon is protected by the WWF as it is a principal wintering site for birds nest That in Europe as well as being an important part of the migratory route. Surely the Argentario coastline is one of the most beautiful areas of Tuscany, with a dramatic cragginess reminiscent of parts of Sardinia. Other than the long sandy beaches of Giannella and Feniglia, Which are well-equipped with bars and other amenities, there are several other smaller Also like sandy beaches, Sweet Water, Long Beach and Cala del Gesso as well as rocky bathing areas like the exclusive Cala Piccola. Other gems like Cala Grande can be Reached only by boat.